In addition to the first fallen leaves we've found on the lawn, there are other tell-tale signs that summer is coming to a close. As you enjoy the end of our summer programs like yoga and knitting, rest assured that there are still fun events and programs in the upcoming season. Keep an eye on our online calendar for scheduling and more details, or stay updated with our Facebook and Twitter. One of the more obvious signs of fall in the park is the disassembling of the Film Festival big screen, which we bid farewell to earlier last week. Throughout the summer it has become a backdrop for many of our summer events and programs and, of course, it has served dutifully as the screen for all 10 of our films screened this summer. Although the Film Festival has come to a close for the season, we have lots of other fun activities and events to look forward to. 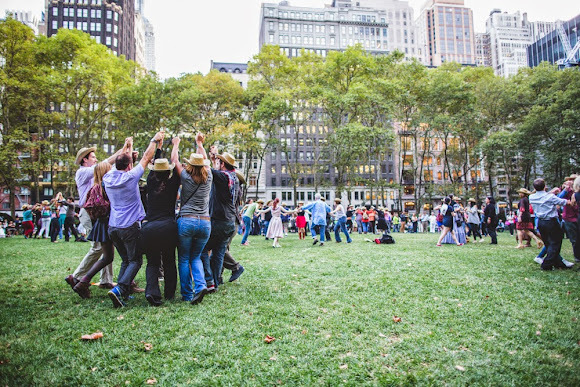 One of our biggest events of the year, Square Dance, is returning on September 19th, 20th, and 21st. What better way to celebrate the beginning of fall than putting on some cowboy shoes, eating some lip-smacking BBQ, and square dancing right on the Bryant Park lawn? Square Dancers gather 'round during last year's event. The onset of fall means the return of many of our favorite programs. Free fencing classes will again be held on the Library Terrace each Friday from September 5th to October 10th at 1-2pm. The Manhattan Fencing Center has sent the best of the best to teach you the basics and all equipment is provided! Call 212-382-2255 to pre-register or take a chance and drop by. 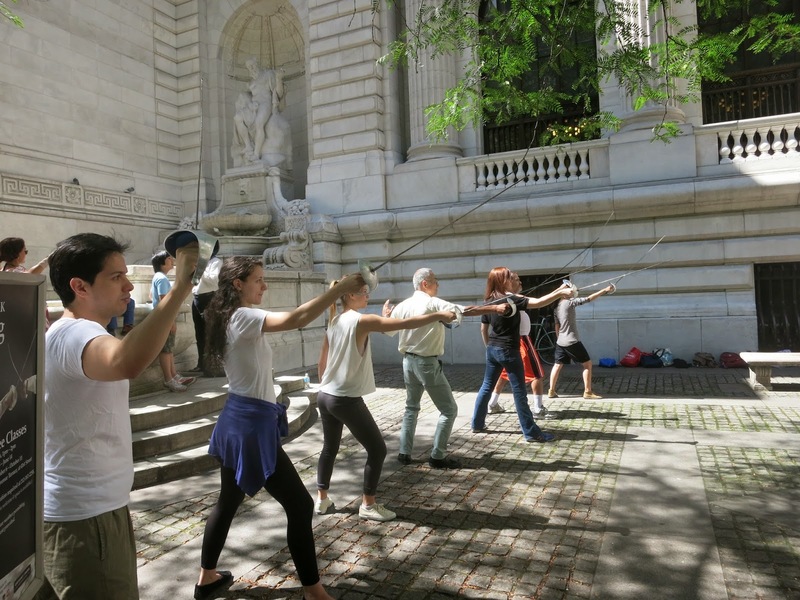 A group practices in the shade of the Library Terrace along Fifth Avenue. Our Birding Tours are also back in action for the upcoming cooler months, picking up again on September 25th. With the help of New York City Audubon, spot some of our feathered friends in Bryant Park's hundreds of trees. Grab some binoculars and join us each Thursday at 8-9am from September 25th to October 23rd. Of course everyone loves summer, but fall deserves some love too. Bryant Park isn't slowing down just because of a few falling leaves or chillier breezes - and neither should you!